Former captain Iker Casillas and Chelsea players Cesc Fabregas and Pedro have been left out of new Spain manager Julen Lopetegui's first squad. 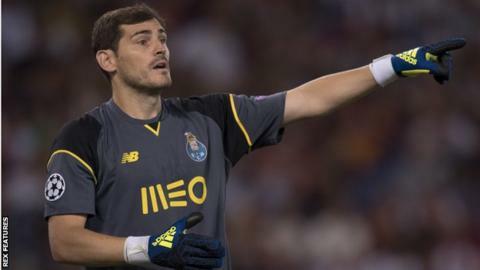 Casillas is Spain's most-capped player with 167, but the 35-year-old has been overlooked for matches against Belgium and Liechtenstein in September. Chelsea's Diego Costa and Manchester United's Juan Mata are recalled after being left out of the Euro 2016 squad. Former Porto boss Lopetegui replaced Vicente del Bosque in July. 29-year-old Fabregas has played 110 times for Spain, while Pedro, also 29, has won 60 caps. Manchester United goalkeeper David de Gea, West Ham counterpart Adrian, Chelsea defender Cesar Azpilicueta and Manchester City pair David Silva and Nolito join Costa and Mata in the squad. Spain face Belgium in a friendly in Brussels on 1 September before hosting Liechtenstein in Leon four days later in their first World Cup qualifier. Defenders: Sergio Ramos, Dani Carvajal (both Real Madrid), Gerard Pique, Jordi Alba (both Barcelona), Marc Bartra (Borussia Dortmund), Cesar Azpilicueta (Chelsea), Javi Martinez (Bayern Munich). Forwards: Paco Alcacer (Valencia), Nolito (Manchester City), Alvaro Morata (Real Madrid), Vitolo (Sevilla), Diego Costa (Chelsea).